The scalable solution for IoT device management challenges, built for you. Extend the reach of your cloud all the way to any IoT device. mbed Cloud is the first complete chip-to-cloud solution, built for IoT. You don t need to recruit a team of experts in every aspect of security, network stacks or technology standards before you can see benefits. Simply take advantage of the industry s largest ecosystem, saving on months of development costs. mbed Cloud offers reliable standards-based communication and delivery, with energy-efficient support for bandwidth-constrained and low-power devices. The service is uniquely optimized for efficiency, regardless of device type, and offers easy expansion as technology matures. Efficient and secure remote device management, including firmware management and fail-safe updates across all devices in a network. mbed Cloud reduces the time and effort required to deploy wide-spread updates, with broadcast and mesh-friendly packages. Supported connectivity includes CoAP/HTTP, TLS DTLS and OMALWM2M, with IoT device communication via REST APIs to enterprise software and web apps. mbed Cloud is built to scale with massive deployments of constrained IoT nodes, using unique caching mechanisms for low-energy devices. Solid transport security using TLS, with secure provisioning and trusted device identity and attestation. 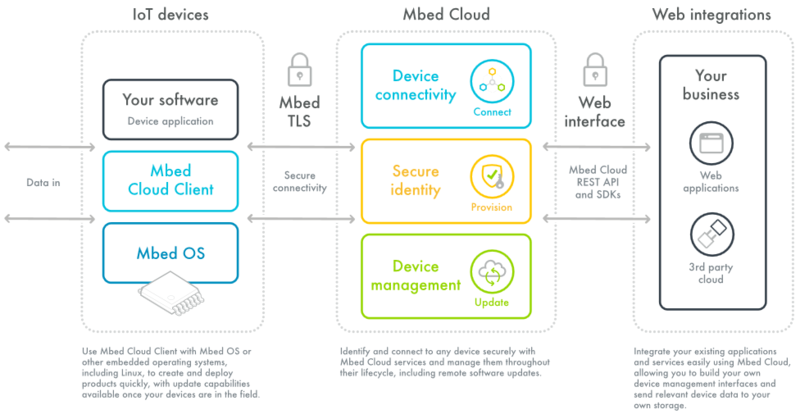 mbed Cloud Provision manages which different trusted parties and devices can access sensor data, bolstering security from the chip to the cloud. Vendor independent, with simple integration through REST APIs, helps accelerate proof of concept projects. Achieve faster scaling, productivity and time to market by enabling developers to use with any device, on any cloud. Highly scalable solution that allows an organization to track, maintain and update an ever-growing number of devices. A modular approach allows enterprises to configure mbed Cloud and tailor the service, as their needs grow and evolve.